Tag line: "The most terrifying ride you'll ever take"
Odds are, I'll never be standing on a New York City subway platform at midnight, but even if I was, after watching The Midnight Meat Train, I'm pretty sure I'd choose to walk instead! Leon (Bradley Cooper) is an amateur photographer who's introduced, through a mutual friend, to Susan Hoff (Brooke Shields), an influential art dealer who recommends to Leon that he dedicate his time to shooting the city's darker side, the seedy night-life of New York's criminals and undesirables. Hoping to make enough money to marry his girlfriend, Maya (Leslie Bibb), Leon takes this advice and hits the streets, searching for the one image that will make him a boatload of cash. But his quest for the perfect picture soon turns into an investigation when, during his travels, he meets up with Mahogany (Vinnie Jones), a butcher by day and murderer by night, who spends his evenings knocking off the after-hours passengers of the city's subway line. Feeling he might be connected to dozens of missing persons cases, Leon starts tracking Mahogany's every move, all the while closing in on a secret he'll soon wish he never uncovered. If there's one image you'll take away from The Midnight Meat Train, it's that of Vinnie Jones' Mahogany casually walking towards his potential victims, brandishing a solid steel hammer. The first person we see him use it on is a pretty model named Erika (Nora), who Leon saved moments earlier from a gang of toughs. This first kill has an almost cartoon-like feel to it, with Jones, out of focus and sitting in the background, creeping up behind Erica and slamming the hammer into the side of her head. There's no blood, but the second kill will more than make up for it, when Mahogany takes his frustrations out on not one, but three passengers. Randle (played by none other than Ted Raimi) gets the hammer to the back of his head, which causes his eye to go flying out of its socket. After disabling a second guy with a shot to the groin, Mahogany turns his attention to Randle's wife, Leigh (Stephanie Mace), who fell after slipping on her husband's eye, and is now crawling across the blood-soaked floor. Switching to a first-person view from Leigh's perspective, we watch as Mahogany brings his weapon of choice down twice on her noggin, the second being strong enough to knock her head halfway across the subway car. A former British football player, Jones' Mahogany sets about murdering, then butchering, his victims, often with chilling detachment. and never uttering so much as a syllable while doing so. Thanks to his imposing stature, Jones makes for an impressive psychopath, and remains a force to be reckoned with throughout most of the film. Now, I'm a big opponent of CGI blood; I've stated in the past how phony I think it looks, and unfortunately, The Midnight Meat Train has some of the worst computer-enhanced splatters I've ever seen. Yet, as bad as they are, they never once took me out of the movie. 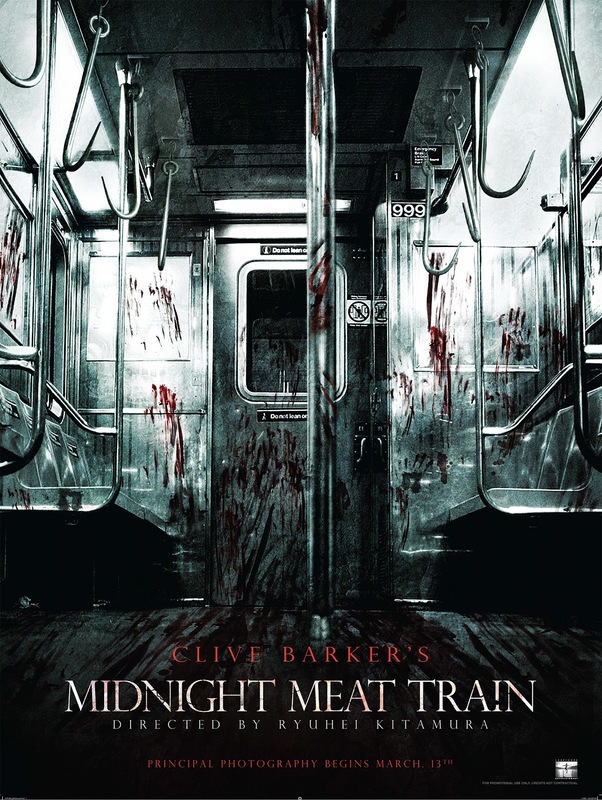 A nerve-wracking motion picture with one of the most fascinating killers in recent memory, The Midnight Meat Train is a gore-soaked horror film that genre fans are sure to love. This movie is based on the Clive Barker short story of the same name. I absolutely loved it and I remember it every time I go on a train after midnight. I could see Vinnie Jones being a good butcher and I will have to watch this movie. This is what I like about your blog, being introduced to movies that will interest me. Keith: Thanks for stopping back again, and for the excellent comment. I've never read the short story, but am obviously a fan of the movie. Vinnie Jones does do a great job as the killer. The kind words are appreciated, and please be sure to stop back and let me know what you think of the movie after you see it! I believe I have this movie in my Netflix Queue. I need to watch this. I haven't read much of Barker's work. I know he's a great horror author but I just don't have the time to read all his stuff. I've heard good things about his story and this movie. Good review. Thanks! Okay my friend, you're on the board, just ordered it on Amazon, after reading your review, I can't resist!